The quantity of historic buildings, historic landscapes and historic districts listed on the National Register is increasing at an explosive rate. There are about 78,700 individual listings, but actually over 1.2 million resources, mostly buildings in historic districts now in the National Register. The buildings of the 1920s, 30s, 40s and 50s arc being listed at an increasing rate. By 2012, it is projected another million resources will be added to the National Register-over two million historic buildings. The challenge for graduates entering historic preservation career for technology colleges like Thaddeus Stevens is "where can students go to learn about rehabilitating historic buildings-not solely through theory and CAD software, but by getting their hands on the actual materials and tools?" Fortunately, the Ddora Foundation, of New York recognizes such a need to perpetuate the preservation of traditional and historical craftsmanship and artisanship. Through a grant provided by the Ddora Foundation to Thaddeus Stevens College this past year, a collaborative program was established with the Pennsylvania Historical Museum Commission to place three of the College's students in summer apprenticeships at Pennsylvania historical sites-The Landis Valley Village and Farm Museum, Lancaster, PA; The Pennsylvania Train Museum, Strasburg, PA; The Daniel Boone Homestead, Boonesboro, PA; and The Fairmount Park Systems, Philadelphia, PA. The Pennsylvania Historical Museum staff and site administrators selected the three Stevens students from eight applications. Those selected were Janelle More '13 (Metal Fabrication & Welding Technology! and Ladale Martin '131Masonry Construction), who had just completed their first year at Stevens and, Dylan Shanta, a 2012 graduate from the Cabinetmaking and Wood Technology program. In late May, all three students completed 12 weeks of apprenticeship on their sites: Janelle Moore (Landis Valley Museum & Strasburg Railroad Museum), Ladale Martin (Fairmount Park), and Dylan Shanta (Daniel Boone Homestead). "Our goal this summer was to introduce other interns to the importance of preservation theory and practice when restoring old structures, "noted Lucy Strackhouse, Executive Director, Fairmount Park. "We strive to teach our interns that it is almost always better to restore existing historic fabric instead of replacing the material with modern materials that are not appropriate. Our interns learn that they can accomplish incredible results with the correct techniques and materials and they are often amazed at the great results of their efforts." The Ddora Foundation provided a partnership opportunity that enhanced the educational experience of Thaddeus Stevens College students. We look forward to more opportunities that can be developed through either the College's Career Services or the College Advancement Office. Foundations of the past ... build futures for our students. 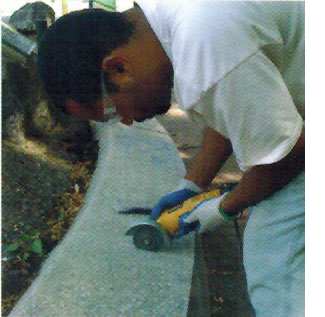 Ladale Martin worked under the supervision of the Fairmount Park's Historic Trust's team of architectural conservators and preservationists to perform a variety of preservation masonry and carpentry projects including: repairs and re-pointing stone and brick, patching and cleaning stone; repairing window sash and jambs, shutters, flooring and porch repairs in historic Philadelphia Mansions; rebuilding fountains, historic garden water pools, Historic Century Guard Houses, and other significant structures around Philadelphia. Janelle Moore experienced the opportunity to assist in restoring the famed "Lindberg" engine, a nationally significant locomotive, located at the Pennsylvania Railroad Museum in Strasburg, PA. She trained with a master craftsman in blacksmithing and tinsmithing at the Landis Valley Village and Farm Museum where she forged various metal tool; tongs, a fork, hooks, campfire accessories, and knives and created tin candlestick holders, graters, a dipper, and other decorative items. Dylan Shanta performed restoration and preservation at the Daniel Boone Homestead, Birdsboro, PA. His diverse duties included milling long, wide pine planks with tongue and groove joinery to be used as a new cellar door at the Daniel Boone house and siding for the Historic Graemes Park house; creating hand forged latches for doors; restoring old window frames and doors and then repairing their foundation by cutting and laying stone by hand and repointing; and repairing the Highlands Mansion porch columns and the decorative ball finials. Thwack! Thwack! Thwack! The sharp blade of the beautifully hand forged Swedish Gradsfors Bruks ax cuts V notches into a large freshly felled oak log. Spaced out every foot or so down the log and cut to a depth marked by two parallel blue chalk lines. The ax then changes direction from cross cutting to a splitting action into the logs end grain. The one foot chunks of outer bark and sap wood of oak go flying off to the side. The ax works its way down the chalk line creating a rough but flat surface. These are the beginning steps of a process known as "hewing," where one shapes a rough timber to a more uniform squareness. 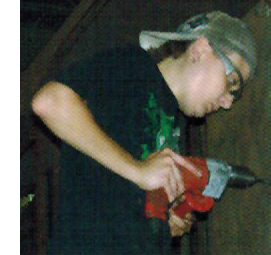 This best describes my experience for the last several years as a college student and as an apprentice in Preservation Trades Craftsmanship summer program offered by the College. I was the rough piece of wood being formed, finished and developed into a person (me) highly prepared for a future in woodworking. At the College, I studied under Robert Tobias and Steve Latta, some of the finest professors I've had the pleasure of knowing and learning from. I came to Stevens to learn about woodworking and its tools, and to hopefully achieve my dream to one day build a log cabin by hand. 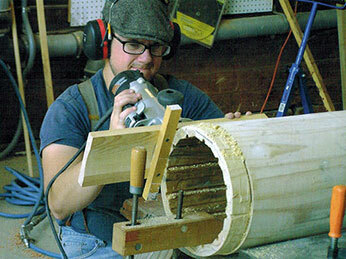 Why study cabinetmaking to build a log home? I wanted to learn from the best about how, why, and the way wood works; the way it moves, shrinks, warps. I wanted to learn how to exploit the wood's strengths and weaknesses. Tf I learned by the smallest, most precise measurements, anything else would seem to work easier. I loved my time in the College's cabinet shop, but like all graduates, a time comes to leave. What to do? I saw a posting for a summer trade apprenticeship sponsored by the Ddora Foundation in cooperation with the College and the PA Historical Museum Commission. Axes, molding planes, handsaws, historic buildings, log homes and more were described! I was hooked! I interviewed and was selected and now I had a summer job and a chance to learn more about how to ultimately achieve my future dreams. I met a lot of people and gained a lot of fascinating information about historical preservation. One such person, who made a major impact on my apprenticeship experience, was Jim Houston, preservationist at the Daniel Boone Homestead. Jim seems to know everything about Pennsylvania history; from small native birds and animals to when and who built every old house. I sometimes felt I' was annoying Jim by picking his brain so much, but the knowledge never seemed to stop and if he was stumped he usually gave a educated hypothesis that always seem to quench your curiosity. During the summer I milled long wide planks with tongue and groove joinery. The planks were used for two projects: A new cellar door at the Daniel Boone house and siding for the Historic Graemes Park house. The calluses continued to form as did the growth of our appetites those days. The shop floor looked like a huge hamster cage and smelled of pine for days after. We constructed the basement doors from the original dimensions and learned how to make modern nails and bolts look hand forged. We replaced the rusted metal door pintles with new ones, and replaced and repaired the Boone Homestead windows. we needed hooks for the doors to latch to the walls, so we forged our own in the homestead's blacksmith shop. Our last major project, restoring all six of the Highland Mansion's columns, required many hours of handcrafting and preservation. So what does all of this tell you? Buildings breathe, a little water can do huge amount of damage, old tools still need to have a place in this world and so do the old tradesmen. Paint does more than just look nice, and our small local treasures are just as worth preserving as our large national ones. In the ever changing world we live in, the memories I have will always be there because these buildings will always be there. So what I truly learned this past summer is that new isn't always better, and old isn't always right, and for the past several years at Thaddeus Stevens College I was truly prepared for a well­centered future. Note: Dylan Shanta is a 25 year old combat veteran and 'proud' 2012 graduate of Thaddeus Stevens College of Technology with an Associate of Applied Science in Cabinetmaking and Wood Technologies. 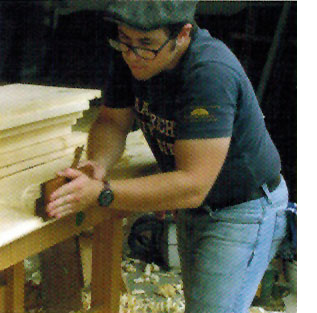 Because of his experience at Daniel Boone Homestead during the summer of 2012, Dylan is currently waiting for a Edward Barnsley Workshop Apprenticeship in England to study under a world renowned master craftsman.